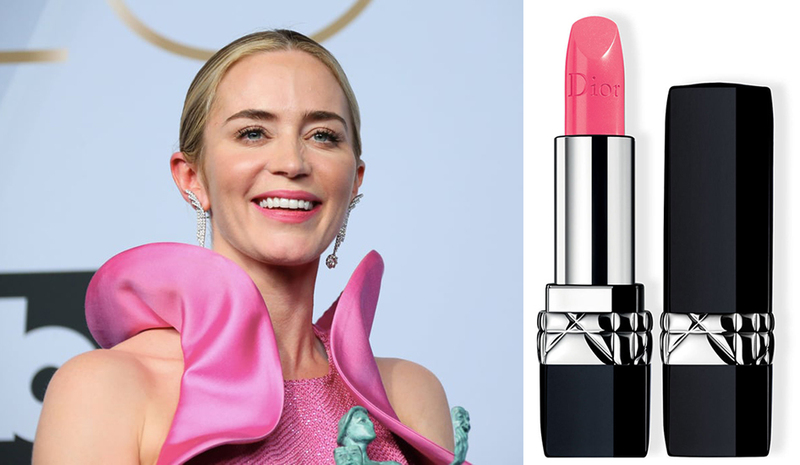 I am a huge fan of Emily Blunt, [I’ve watched the latest Mary Poppins just because of her], and actually posted a few of her makeup breakdowns in the past so am happy to share about her latest look from the SAG awards. Not only she looked gorgeous but she also won Outstanding Performance by a Female Actor in a Supporting Role. Here is a breakdown of the look which was posted by her make-up artist Jenn Streicher who used all Dior products on Emily. I love the glowing skin, minimum eye makeup, and a bright pink lip which is matching her dress and nails. She looks glowing! I thought that I should also show you my favourite looks from the SAG Awards. I really loved the makeup of Marion Cotillard. And it’s not a surprise after all because I really like her. But I can’t say that I liked her dress. As for the other celebrity – it is Diana Kruger. She looked absolutely amazing: both the look and the dress. I love Emily Blunt and I think that she always looks gorgeous! And she looked stunning at the 62nd Annual Primetime Emmy Awards in a beautiful lavender dress from Dior’s 2010 Resort Collection. Besides beautiful dress and makeup she always has a great hair style and I got some tips oh now to create it yourself. Laini Reeves, who also styled the hair for Emily Blunt’s recent wedding, created a fresh yet sophisticated look inspired by the iconic finger waves of the 20s. She used lightweight, instantly-absorbed argan oil-infused Moroccanoil products to style Emily’s shoulder length layered hair into a beautiful waved design that fell slightly below the jawline on the sides, and with shorter, pincurled accents at the nape of the neck. “We wanted to create a look that was very different from any that Emily had worn before. Once I saw the gown, I knew that a modern look based on the waved looks of the 20’s was the perfect compliment for the design. I first shampooed Emily’s hair with Moroccanoil Moisture Repair Shampoo to leave it soft, shiny and well conditioned for the intricacies of styling. After mixing a cocktail of Moroccanoil Intense Curl Cream and the original Moroccanoil Treatment, I worked the blend from the middle to the ends of the hair to control ends and flyaways and provide natural-looking, soft hold.